LEESBURG | Votive devotional candles now burn brightly beside the statue of the Virgin Mary at St. Paul Catholic Parish in Leesburg thanks to an anonymous donor. The candles are part of the final touches to the parish’s yearlong, $4.2 million remodeling project dedicated in February. Changes included additional seating, choir loft, and sacristy among other things. 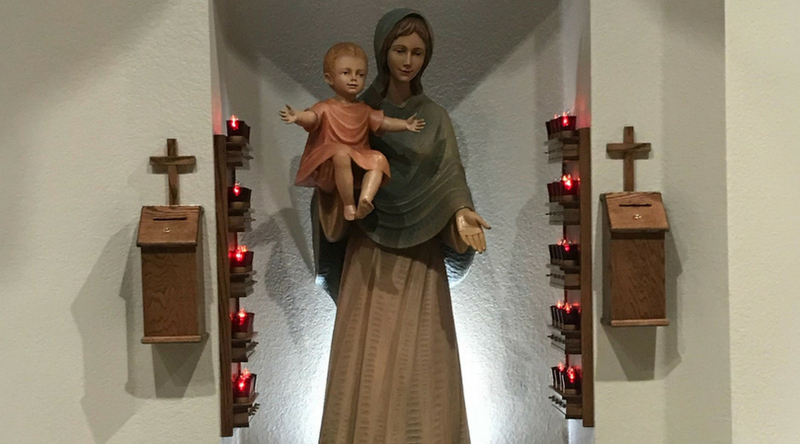 The generous donor “has a great devotion to the Blessed Mother and was particularly interested in adding the candles,” said parish staff member Mary Wymer. “Votive” means promise or simple prayer in Latin. The addition of the candles follows a long tradition dating back as far as the early 200s. Father Jeremiah Payne, pastor of St. Joseph Parish in Palm Bay and host of “Apologetics Friday” on Divine Mercy Radio, explained, “from the menorah in Jerusalem’s ancient Temple to the radiance of the Paschal Candle illuminating the dark hours of Holy Saturday, candles and fire have always been rich symbols of Judeo-Christian faith and worship. They symbolize God’s “light of revelation” (cf. Lk 2:32) through Jesus, who is “the light of the world” (cf. Jn 8:12). The parish has also ordered candles and stands to place by the statues of St. Paul and St. Joseph as well. Wymer said they should be installed by Advent.